The original Southeast Alaska Animal Medical Center building ​​​​​​​was a charming dairy milk house. Our current facility is light, bright and filled with the most current medical equipment to best serve your companion. Established over fifty years ago, Southeast Alaska Animal Medical Center has seven veterinarians serving the needs of Southeast Alaska pets in a state-of-the-art facility in Juneau, Alaska. Owned by Dr. Patrick Taylor, Dr. Lisa Kramer, Dr. Steven Torrence, and Dr. Gerald Nance, our hospital strives to provide the best possible care to all Southeast Alaska pets. Besides the owner veterinarians, our current team of veterinarians include Dr. Maura Westerdahl, Dr. Jennifer Tobiason, and Dr. Todd Campbell. 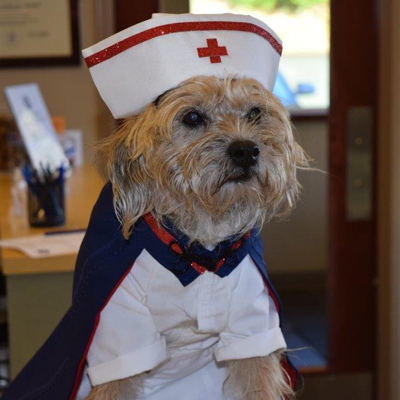 Bee Gitkov, long time patient of Southeast Alaska Animal Medical Center, is dressed and ready to help the medical staff. Southeast Alaska Animal Medical Center, formerly Southeast Alaska Veterinary Clinic, is the oldest established veterinary practice in the region. It was founded in 1962 by Dr. Cliff Lobaugh in the former milk house for the old Danner dairy. The original building was remodeled and enlarged many times, retaining the charm of the original milk house. The practice eventually outgrew the building, however, and in 2003 we began planning for a new building, designed specifically for the needs of our patients, clients, and staff. At long last, we moved into the new facility in March 2005. 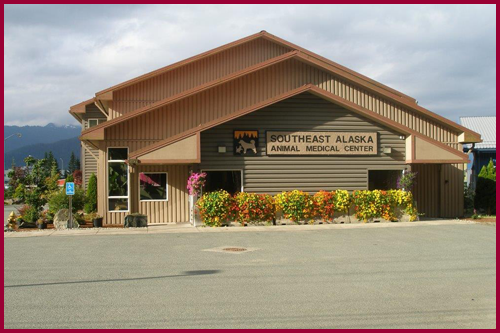 Along with the new look came the new name – Southeast Alaska Animal Medical Center. ​The original practice area covered all of Southeast Alaska and Northwest Canada (Yukon territory and Northwest British Columbia). The practice had a population base of 30,000 people scattered throughout three different time zones. Dr. Lobaugh held clinics in Ketchikan, Sitka and Whitehorse and was known locally as “the traveling doctor”. Dr. Patrick Taylor joined the practice in 1972 and expanded the veterinary service to include visits to Wrangell, Petersburg, Haines and Skagway. In 1980, Dr. Lisa Kramer joined the practice, and as the area’s population expanded, the clinic became busier and busier. After 33 years of practice, Dr. Lobaugh retired in 1995. Since then, Dr. Taylor and Dr. Kramer have shared ownership of the clinic, having added Dr. Steven Torrence in 2007, and Dr. Gerry Nance in 2013. Southeast Alaska Veterinary Clinic has evolved from a one man, traveling veterinary practice in 1962 to a large multi-doctor hospital serving Juneau and the surrounding communities in Southeast Alaska.